Ontario Soccer has announced the roster for the Ontario Soccer Summit 2019 in London, Ont. and this year’s crop of speakers are certain to be a watershed moment in the history of the event. 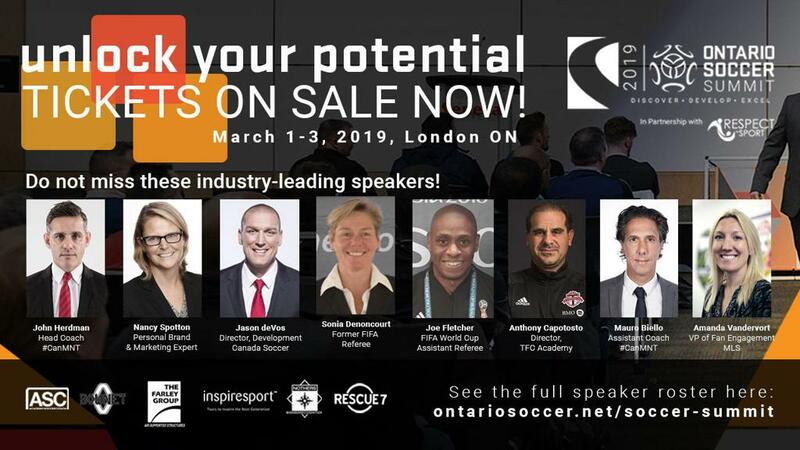 The speakers, which hail from across the soccer spectrum, will pull on their depth of experience and bring their vast expertise to the BMO Centre and Wolf Performance Hall in London from March 1-3, 2019. Headlining this year’s events are three keynote speakers. The first is John Herdman, the Canadian Men’s National team Head Coach and the key figure who led the Canadian Women’s National team to two consecutive Olympic bronze medals. He will be joined by legendary match official Howard Webb, who is now on the forefront of soccer technology, as he heads up the Video Assistant Referee program with Major League Soccer. The keynote speakers are rounded out by Nancy Spotton, the CEO and Co-Founder of MPWR, a group that is powering the next generation of trailblazers in sport and society and is quickly becoming known for their use of aggregated data to create powerful talent development programs that inspire performance. Tickets went on sale today. 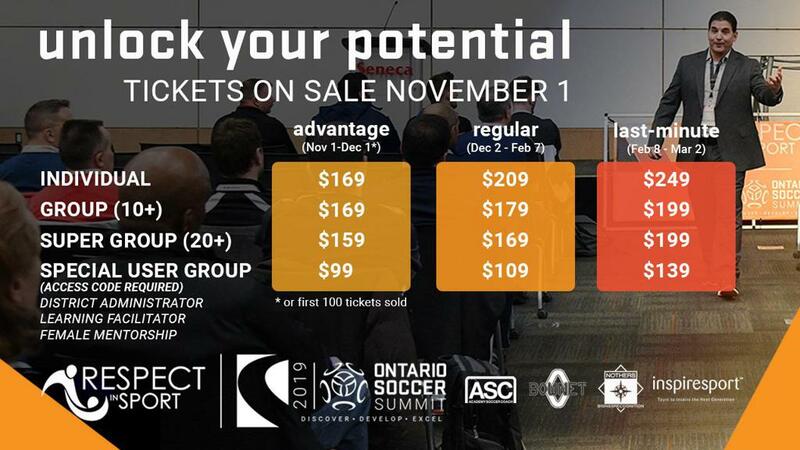 Visit OntarioSoccer.net/SummitTickets to register and purchase yours. The first window of advantage pricing, which offers the best dollar value anywhere in soccer development, closes Dec. 1 for this team-building event. With only 100 tickets available during this initial period, be sure to act quickly as prices will increase incrementally after Dec. 1. Today’s announcement, which includes speakers from the Technical Leaders, Match Official Development and Community Leadership streams, are equally as robust. The technical leaders announced, who will be joining the Ontario Soccer Summit 2019 are: Hugo Blanco (Sports Projects in LaLiga), Jason deVos (Canada Soccer Director of Development), Mauro Biello (Assistant Coach of the Canadian Men’s National team), Dave Nutt (Manager of Canada Soccer Development Operations), Anthony Capotosto (Toronto FC Academy Director), Paul Jurbala (Director, Knowledge with Sport For Life Society), Barry Jansen (Performance Consultant with JansenHR), Richard Bucciarelli (a Professional Fitness Coach and owner of Soccer Fitness Inc.) and Ontario Soccer’s own Gary Miller, Technical Director. The Match Official speakers who will be joining the Ontario Soccer Summit 2019 will be a pair of returning faces in Joe Fletcher and Sonia Denoncourt. The Community Leadership speakers who will be joining the Ontario Soccer Summit 2019 are: Amanda Vandervort (MLS, Vice President of Fan Engagement), Matt Greenwood (Executive Director, Pickering Soccer Club and their All Abilities Program), Alan Hollingsworth (HUB International Insurance, Senior Vice President) and Ontario Soccer’s Lyn Wallington, Senior Manager of Operations. Two panel discussions will also take place at the Ontario Soccer Summit. The first panel will be a fireside chat with soccer luminaries from the grassroots to the highest levels of the game and the second will focus on how to keep girls in soccer longer. The speakers for both panels will be announced in the weeks ahead. Check the Ontario Soccer Summit news section regularly for updates on speakers, events or how to become an Ontario Soccer Summit partner.